For the last few months, I have been spying little jars of soffritto paste in the specialty foods aisles of various supermarkets. Snuggled next to such exoticisms as ancho chillies, dried porcini mushrooms, and other things that it is ‘nice to have but not essential’ (although Waitrose now feature artichoke hearts in their Essentials range, for the love of God!). I picked a jar up out of curiosity, as I like to imitate fancy ingredients myself, cheaply, on this here blog, to make them more accessible. I turned it over, bracing myself for the hard-to-find ingredients contained within, steeling my nerves for the inevitable reverse-engineering process to follow…and snorted with laughter. 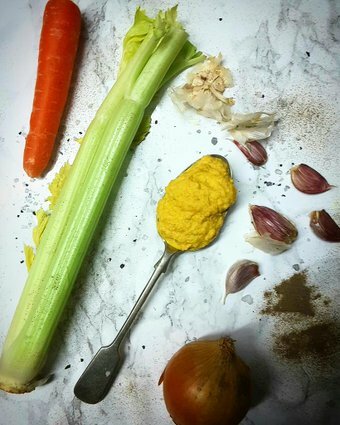 This jar of soothingly yellow paste contained such far-flung ingredients as celery, carrots and onion, with a dash of salt and pepper. I snapped a quick photo of the label, and went back to the vegetable aisle, picking up 3kg of carrots and onions and a bag of celery for less than the puny jar of paste would have cost. Such is often the way. This recipe makes a massive jar of soffritto paste, which can be halved or quartered and frozen to use in future ventures, so I will be posting some recipes for it after this one, some quick and easy uses. Having just whipped it up, it is so, so much more than the sum of its parts; the onions and carrots give it an underlying sweetness, the garlic cuts through with a slight tang, and because I am a maverick, I threw some lemon juice in there to brighten it up a little, for which I hope my Italian readership will forgive me. I am planning to use it in a risotto, as a simple soup, as a more hearty soup, and as a pasta sauce, and as ever, would welcome your suggestions in the comments below. Makes a large jar, around 800g depending on sizes of vegetables used, for 76p. That’s 19p per 200g, compared to £1.49 at certain supermarkets. Prices are based on Sainsburys, Basics range where available, as it’s where I did my weekly shop this week. My new years resolution *is* to hop around a bit, so watch this space! Hi – not Jack, but a fellow Slimming World member. A lot of the recipes in the original ‘Girl Called Jack’ cookbook can be adapted easily. Substitute FryLight for the odd tablespoon of oil. Bake falafels and burgers instead of frying. With sweet recipes you can add Canderel (or similar) instead of regular sugar. I adapt a lot of the meaty recipes to be vegetarian too, substituting Quorn (one of those Free Foods). Hope that helps. My sofrito for a (vegetarian) bolognaise sauce is exactly that: onion, celery, carrot, garlic, s and p. I don’t zap it though, preferring to dice the veg to ensure some texture. I wrote a similar post about olive pate. Why was I paying more than three euros when I could buy a bag/jar/tin of olives and zap them with olive oil, garlic, s and p, and lemon (including skin)? A fraction of the price. Also, my perennially most looked-at blog post. I’m loving your Veganuary bargain recipes, keep them coming! I am just so glad, Jack, that you have been more present lately in my inbox! I sometimes have a lot of work to do since I live “across the pond” and have to convert measurements, and sometimes look up a word since there are variations between English and American. But, as a senior citizen, you have teased my tastebuds with your offerings…altho I have to admit that I often modify them a bit as I am neither vegan nor vegetarian, being a lover of seafood and fowl. Happy New Year… I wish you the best for a healthy, happy 2017! I’ve never heard of Soffritto before (sorry) so looked it up on Quora. Apparently it’s a great addition to mashed potato. I’m going to give it a go with that and maybe soup. I think it would also be great with quick whisked up egg in the microwave (my usual breakfast). I sometimes add a tablespoon of homemade soup into the egg and that works well so I think this will too. Thanks for the tip – I’ve got all if these things in the cupboard so something new to try. Yum. Can you taste the celery because that is one veg I can’t stand? I haven’t made this recipe, so I don’t know if you can taste the celery, but celeriac (celery root) tastes considerably milder than celery stalks and might be a good alternative to try? The Happy Pear vegan chefs (see YouTube) use celeriac instead of celery in their mirepoix (carrot, onion, celery soup starter mix). You are so inventive and I am so glad you are back again! Thanks and Happy New Year. My daughter lives in Leigh on Sea and I know this is or was your part of the world. Loving these thrifty and tasty recipes Jack…and forwarding your emails to friends and Family. Visited my local large ‘S’ shop today,you know the one I mean and your influence re basic range products and recipes are not far from thought. Yummy & smart cooking!!!! I think I’ll also use this to flavour a tagine/couscous dish and thanks to your blog that’s exactly what I’ll be doing tomorrow to accompany some slow cooked lamb shanks. I have a jar (yes, should have made my own!) of preserved lemons so now it’s opened (used with green lentils, broccoli, kale, toasted walnuts & sundried toms, parsley…went lovingly with fish fingers for the family tea!) I will throw a couple of those chopped, into the dish. Love cramming in flavour, using simple cooking and stretching one dish into another! Cheers Jack!!! Delighted to see you blogging 🙂 . Looking forward to trying this out, thanks for sharing. Thanks for the great recipes Jack. Sorry to hear about your arthritis. I’ve had relief from arthritis by including flaxmeal in my diet. Cheers. Jack’s BACK! Woo hoo, I’ve missed the email kick in the pants to try out new recipes. Happy New Year! A dollop of this loosened with only old oil transforms parsnip soup, it is also delicious on oatcakes lightly sprinkled with smoked paprika. I use it anywhere hummus would feel welcome. Thanks, Jack. I just got 2 big bags of carrots for 10p, onions for 10p and celery for 5p in the Tesco New Year clearout, Now I have a tasty, healthy alternative for using them, rather than just making heaps of soup! Just the job for combatting the winter blues. Sounds like the base I have always used for soups etc. Didn’t realise it had a fancy name. Waitrose DO have some strange ideas about “essential” items. Smoked salmon? Your blog is my tea time saviour. Cheap tasty food full of sunshine just what is needed in penny pinching dull January! Hadn’t heard of soffritto before now, but I’m definitely going to give it a whirl. Nice one, Jack; good to see you back in action! I agree with roughseas that chopped veg gives more texture. Also, in my experience there should be a bit more onion, about the same by weight as the other two, that is, 400 g in this case. And I prefer old, nasty carrots or the result is too sweetish. It’s a nice variation to replace half the onion with 200 g leeks, too. Using the salt to season the chopped veg, and then letting it stand while the fat gets hot, draws the water so that it softens properly instead of boiling. Now, may I nitpick a bit? Despite what the jar had listed as ingedients, what you describe here – bar the garlic and lemon – is really French ‘mirepoix’ or English ‘soup greens’. For ‘white mirepoix’ (to use in white stock), replace the carrot with the same weight of parsnip and mushroom. To make “proper” (ha!) Italian ‘soffrito,’ one adds half a bunch of chopped, fresh parsley at the end of cooking, and lemon juice is certainly not out of place there. Thanks, Jack, and keep ’em coming! Waitrose, really. Wow you’ve certainly come a long way in the last 4 years. Would never have seen you go into Waitrose then. I use soffrito all the time as a base for soups and stews, particularly bolognaise (which I then use as a pasta sauce, in lasagna, as a pizza topping or as a calzone filling for lunchbox freezer staples). I make white soffrito as a base for risottos: finely diced celeriac, onion, garlic and maybe the white part of leeks and maybe the stem part of cauliflower (if that goes With the planned finished dish). I’ve never canned soffrito, but I have very successfully made large batches in the fall when veg was cheap and frozen in portion sized freezer bags to use later. I freeze it too, but mostly because its just as easy to make x2! What a great idea – I’m definitely going to put some in the freezer – brilliant base for pretty much any soup or pasta sauce. I cannot believe that people actually pay to have this stuff put in a jar for them though. We must be missing something. Aces! I used this with your Courgette, Tomato & Brie Gratin in place of Brief (to make it vegan but keep it creamy) – I spread a layer of soffrito on top of the rice and then layed the courgette on top. Was really delicious! A few new things to try that never heard of! I asked my daughter to buy your first cookbook for me for Christmas. It is fantastic. I have made several of the recipes and love them. It is great that you are blogging again. So great to see you blogging again. You have been missed. Great to use as a gravy base. I have been doing a variation of his for ages without knowing it is a “thing” until I went to Spain recently. I started doing it to make soups and pasta sauces more textured and filling when I went back to uni as a mature aged and was really “poor”. It is great to see this blog back jack. Lovely and I warm a bit of leftover pasta in any sauce, dip and a good sprinkle of nooch, any salad or tin of chickpeas, kidney beans, or cannelini and that’s 2 meals easily! Took much longer than 15=20 minutes to soften enough for me. But loved result. Maybe next time I’ll sling it all into Pyrex casserloe dish and microwave it. Thanks Jack for showing me how to cook. I used to follow recipes slavishly. Now I am confident to chuck stuff in, and use uo whatever is in the fridge. We used to bin loads, now we shoo more savily, and use most of it. Again used soffritto base, chucked in cumin, paprika and voriander (all ground), added a can of tomatoes and stock from a cube. Cooked for 20 mins, then added can chickpeas- drained, and can baked beans with sauce rinsed off, cooked 10 more mins, added some chopped fresh parsley and salt and peppee. Then part blended. Delicious. Made a filling meal with some garlic bread. I will take some to work tomorrow, and will still have some left. Love the onion, celery and carrot combo! I’ve been accidentally using soffritto for a while now without realising, by putting the same ingredients, cut into slivers, under chickens and joints of meat when I steam-roast (1 veggie stock cube and 1/2 pint water added plus a lid – the lemon goes, chopped along with an elderly apple, inside the chicken to moisturise it). When the meat’s cooked, I stick-blend the liquid and soggy veggies then sieve them so we don’t get celery fibres trailing from our teeth, and use the liquid as a basis for gravy. A dollop of browning darkens it, then add some liquor from cooking the veg and a bit of worcester sauce, marmite or whatever you fancy, and it makes gorgeous gravy. I’m still learning from you, as I’m making my way to the top as well. I absolutely love reading everything that is written on your site.Keep the information coming. I enjoyed it!